Star Wars Tween Spinner Luggage. Hardside luggage is now available in a new size for tweens, featuring popular prints of our most beloved characters from Frozen, Marvel, Pixar, Mattel, Minions, Star Wars and many more. This 21" luggage offers four spinner wheels, spreading the weight evenly while allowing for smooth and effortless motion in different terrains. This 21" Luggage is Carry-on Approved. Your child can take this colorful and lightweight luggage everywhere, packed with all their special items for school, their next sports practice, play dates, field trips, or as the perfect carry-on for the next family vacation. 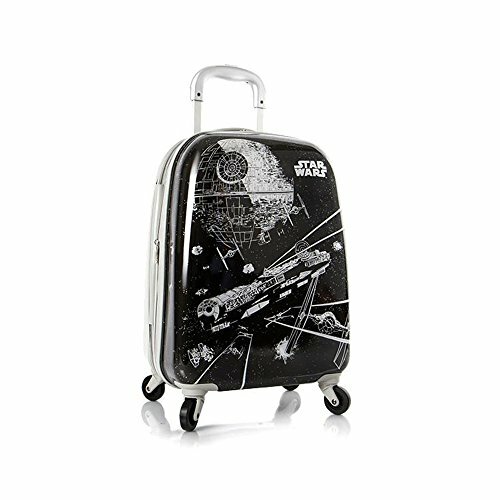 MATERIAL: We provide exclusive designed new easy to carry Star Wars Tween Spinner Luggage for boys. Made of ABS / Polycarbonate composite. SIZE & WEIGHT: Ideal size for easy to carry and the measures approximately 21" x 13" x 9" - 50.8cm x 33.2cm x 22.9cm. Weight: 5.2 lbs - 2.4 kg. For its medium size, it is flexible to carry and packaging. COLOR INFO: Exclusive color combination with Black and Gray make an eye-catching look for kids. Beautifully printed hard shell features popular design from Star Wars. FEATURES: This 21" Luggage is Carry-on Approved. Its four spinner wheels spread the weight evenly while allowing for smooth and effortless motion in different terrains. PERFECT GIFT: Perfect gift for your child. Lightweight and spacious. This awesome Luggage will sure to bring smile to that precious face you love so much!